As Ryan Florence once said, the essence of working with components is worrying about the right lines to draw in your app and then filling in the shapes they create with components. 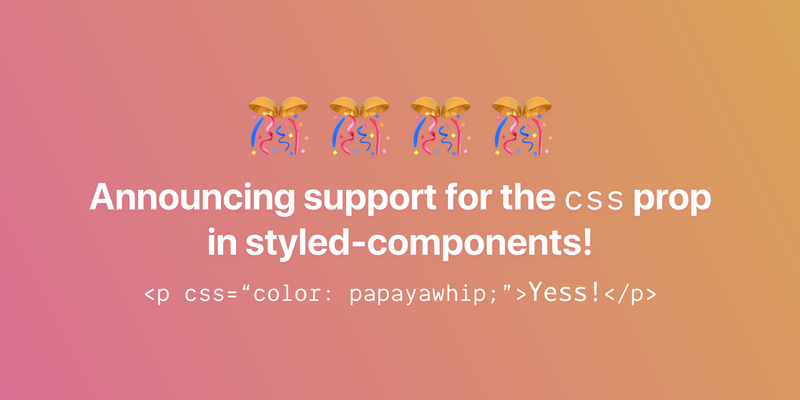 Invented by Sunil Pai in glamor, the css prop has taken over the CSS-in-JS world as a convenient way to build components while staying flexible with the “lines”, their boundaries. By declaring the CSS inline, it’s simple to move elements around your app and iterate on them, allowing you to keep moving fast in the early stages. Then, once you feel comfortable with the boundaries you’ve chosen, you can quickly turn them into styled components and lock them into place. So far, to get support for the cssprop in styled-components, you had to use user-land libraries such as rebass. They worked great, but required a lot of manual work and the implementation wasn’t the most performant. If you aren’t using the Babel plugin yet, you also have to add it to your .babelrc. Huge shoutout to Satyajit Sahoo, who came up with this ingenious technique! We hope you enjoy the css prop. 💜 If you want to learn more check out the documentation, and let us know what you think in the community! Technical cofounder of Spectrum.chat, creator of react-boilerplate, co-creator of 💅 styled-components and maintainer of KeystoneJS and micro-analytics.